severe in nature's garb, so light and yet so dark. I'll give you eternal wisdom, youth and love, she said. In return she wanted my body, and entered my head. so she divided me to cause no pain. but in the end we couldn't draw the line. I lost my identity, I lost my soul. conquer my fears to stay alive. "from now on we can have it all". reached for the heavens but didn't fly. We turned back to where it all begun. I had to get through the genesis in reverse. I'd regain my body, I'd regain my head... .
Deze week is het reisthema op Ailsa's blog "Cirkels". 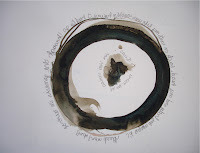 "Circles is the travel theme for this week on "Where's my backpack", Ailsa's blog.